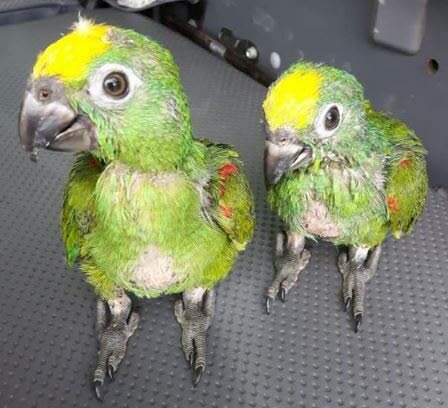 SQUAWKS from inside the trunk of a car during a routine search by police in Moruga on Monday led to the discovery of two yellow crown baby parrots. The birds, which are protected under the Conservation of Wildlife Act, were in a brown box. The driver of the car, Rajiv Nanaoosingh, who told police a friend gave him the parrots,was arrested and charged. Nanoosingh appeared before Magistrate Nalini Singh in the Rio Claro Magistrates' Court charged with possessions of protected animals. He pleaded guilty to the charge, which laid by PC Darryl Phagoo. The parrots were shown to the magistrate and at the end of the hearing they were taken to the Emperor Valley Zoo. Prosecutor Sgt Shazie Mohammed told the court that on Monday at 5.30pm, PCs Phagoo and Latchman Bissoon were doing a routine check on drivers in Gran Chemin, Moruga. While questioning Nanaoosingh, police heard squawks from the trunk, searched the car and found the parrots. 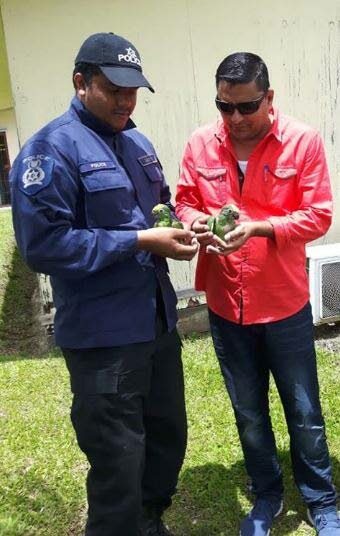 Game wardens Andy Singh, Haydeen Simmons and Visham Madhu were contacted and took the parrots into their care. The magistrate fined Nanoosingh $5,000 and will serve two months' imprisonment in default on each charge. He was given two weeks to pay the fine. There are over 25 species of parrots in TT, many of them are protected. If an individual is in possession of a parrot during the close season, he or she must have a permit. Reply to "Squawking parrots lead to arrest"